Designed by Giuseppe Battista Falchetto it first appeared at the Milan Show in 1950. It had scooter-like characteristics including the position of the tank, a large foot platform rather than footpegs, and smaller wheels than a conventional motorcycle - although still larger than most scooters. The single-spar frame housed a 147cc fourstroke engine tilted forward 70 degrees. Engine capacity was increased to 163cc for 1952. The second series entered production in 1953 with a more powerful motor and improved oil retention. 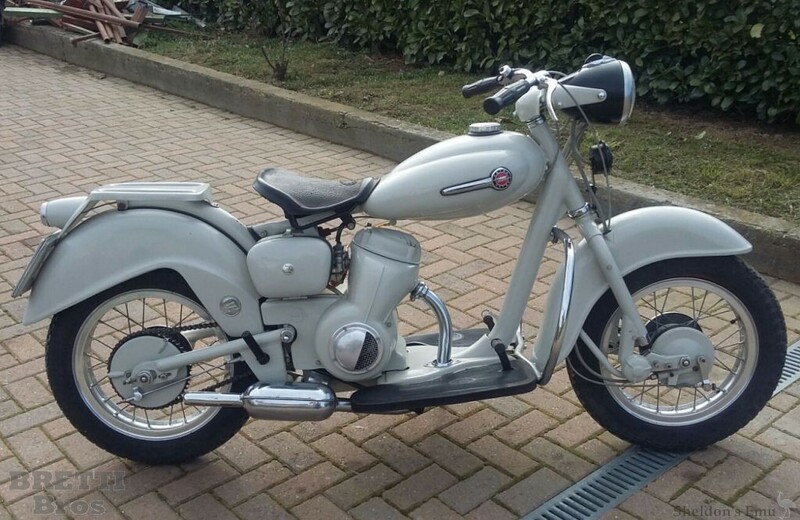 1955 saw the introduction of the series 3 Delfino, which had improved electrics and other refinements, but with a price more than 50% greater than its Vespa and Lambretta rivals it did not sell well and production ceased in 1957. Several other manufacturers built similar scooter/motorcycle hybrids including MV with their Pullman and the Rumi Formicino.